available vacancies in this MGNREGA ZP Raipur District are 59 posts. Interested candidates for the above vacancies may apply before last date i.e 5th December-2017. Download the application from the MGNREGA CG official website at http://mgnrega.cg.gov.in/. Applications must have to reach the Chief Executive Officer, Raipur District Panchayat, Chhattisgarh through post before 05-12-2017. Candidates must have age limit between 21 years to 35 years as on 01-11-2017. Zilla Panchayat Raipur District Recruitment vacancies will be filled based on candidate academic qualification marks and personal Interview. Selected candidates for Technical Assistant will be paid Rs. 23,010/- and for Assistant Grade III jobs is Rs. 12,675/-. 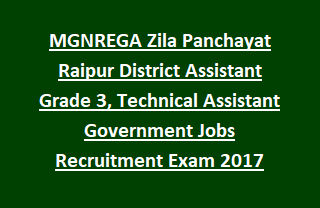 Please see the below given information for Age limits, Application process, Selection Process, Educational Qualifications, salary details regarding MGNREGA Zila Panchayat Raipur District Recruitment of 59 Technical Assistant and Assistant Grade-3 Government Jobs Notification 2017. Closing date for submission of MGNREGA ZP Raipur Dist application forms: 05-December-2017. 1. Technical Assistant: 46 post. 2. Assistant Grade 3: 13 posts. Total no of vacancies: 59 posts. Category wise vacancies are mentioned in the notification. Candidate should have upper age limit is 35 years and lower age limit is 21 years as on 01-12-2017. Age Relaxations for reserved candidates applicable as per Government rules. Technical Assistant: Polytechnic Diploma in Civil or BE/ B. Tech in Civil/ Agriculture or BSc Maths or MSc in Physics/ Maths or BE/ Diploma in any branch. Assistant Grade-3: Must have completed two years DEO/ Programming Diploma with 5000 Key Depressions in Hindi/ English. For detailed qualification info see the MGNREGA notification. Selection of candidates for ZP Raipur District MGNREGA Recruitment Technical Assistant, Assistant Grade-3 jobs will be based on qualification marks and Personal Interview. Eligible candidates interested to apply for MGNREGA ZP Raipur Dist Technical Assistant Jobs may go through the official web http://mgnrega.cg.gov.in/. Download the application and submit to the below given address before 05-December-2017.